March 2018 | TOMMY JOHNSON, Jr.
LAS VEGAS – Already a fan of four-wide racing and running at The Strip at Las Vegas Motor Speedway, Funny Car’s Tommy Johnson Jr. is excited to see what that means for him when those aspects are combined for the first time at the upcoming 19th annual DENSO Spark Plugs NHRA Four-Wide Nationals, April 6-8 in Las Vegas. It is the debut of NHRA Mello Yello Drag Racing Series four-wide racing, one of the biggest spectacles in motorsports, on the West Coast, and Johnson, the defending winner of the Las Vegas spring race, is one of many who can’t wait for the highly-anticipated race. 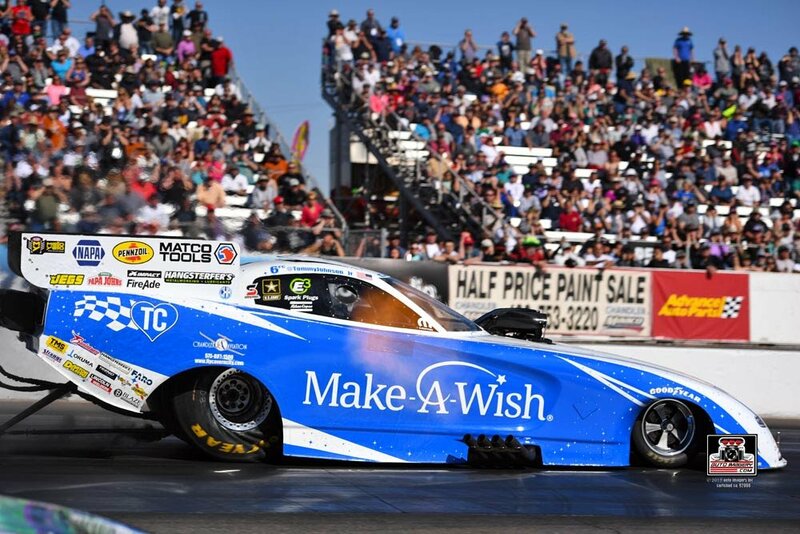 Add in five career final round appearances at The Strip at Las Vegas Motor Speedway and Johnson believes something special could take place in his 10,000-horsepower Make-A-Wish Dodge Charger R/T Funny Car. Antron Brown (Top Fuel), Johnson (Funny Car) and Tanner Gray (Pro Stock) were last year’s winners of the event that will be televised on FOX Sports 1, including finals coverage starting at 6 p.m. (ET) on Sunday, April 8. It is the fourth of 24 races during the 2018 NHRA season, providing fans out West the chance to see four 10,000-horsepower nitro machines go down the track simultaneously. It’s a thrill unlike anything in drag racing and Johnson has always enjoyed the intricacies of the unique race, which also takes place in Charlotte at zMAX Dragway. With double the amount of cars, it presents new challenges and difficulties, but Johnson, currently sixth in Funny Car points, likes the extra elements of facing off with three other cars. It’s been a solid start to 2018 even as the team, led by crew chief John Collins, started using a new six-disc clutch set-up this season, reaching the final round in Phoenix and qualifying well at Gainesville. Johnson also knows what an early-season win can do for a team, especially in a loaded Funny Car class that features Don Schumacher Racing teammates Matt Hagan, the current points leader, Ron Capps and Gainesville winner Jack Beckman, as well as Phoenix winner Courtney Force, defending champ Robert Hight, Shawn Langdon, Del Worsham and Jonnie Lindberg. Brown earned his second straight win at the spring Vegas race in Top Fuel in 2017, and is seeking his first win in 2018 against the likes of points leader Steve Torrence, Gainesville winner Richie Crampton and defending world champ Brittany Force. Gray became the youngest Pro Stock winner in NHRA history a year ago and just won in Gainesville. He’ll face off with points leader Bo Butner, Jason Line and Erica Enders. The event also features the K&N Horsepower Challenge for eight top Pro Stock drivers. Bragging rights and a hefty $50,000 paycheck is on the line for the Saturday specialty race. Greg Anderson has won two straight K&N Horsepower Challenge races. The event also features competition in the NHRA Lucas Oil Drag Racing Series, as well as the Mickey Thompson Tires NHRA Top Fuel Harley Drag Racing Series. After nitro qualifying on Friday, the Segal Motorsports Fire Starter, American Freedom Fighter & Lucas Oil Muy Caliente Jet Cars will thrill the fans. Known for their pre-run flame shows and after burner pops, jet cars are thrust driven vehicles propelled by jet engines. As always, fans will have the opportunity to interact with their favorite drivers as they’re granted an exclusive pit pass to the most powerful and sensory-filled motorsports attraction on the planet. This unique opportunity in motorsports gives fans direct access to the teams, allowing them to see firsthand the highly-skilled mechanics service their hot rods between rounds, and get autographs from their favorite NHRA drivers. Fans also will want to visit NHRA’s popular Nitro Alley and Manufacturers Midway, where sponsors and race vendors create a carnival atmosphere, with interactive displays, simulated competitions, merchandise, food and fun for the entire family. Mello Yello Drag Racing Series qualifying will feature two rounds at 12:30 and 3:30 p.m. on Friday, April 6 and the final two rounds of qualifying on Saturday, April 7, at 12:10 and 2:45 p.m. Final eliminations are scheduled for 12 p.m. on Sunday, April 8. To purchase general-admission or reserved seats, call (800) 644-4444 or visit www.NHRA.com/tickets. Kids 12 and under are free in general admission areas with a paid adult. To honor the Salute to First Responders, military and first responders can save 20 percent on general admission tickets at the gate. For more information about the NHRA visit www.NHRA.com. After qualifying in the top half of the field, the most recent Funny Car runner-up faced Cruz Pedregon in round one. Johnson was first out of the gate and never trailed, driving Terry and Doug Chandler’s Make-A-Wish Dodge Charger R/T to the win with a clean and straight pass. In round two, Johnson once again had the starting line advantage. Unfortunately for Johnson, his opponent Shawn Langdon was able to pull ahead early into the run and take the win against Johnson’s tire smoking effort. “We’re making a little progress, but we’re going to have to keep working at it. We’ve got good data on the six-disc [clutch]. When track conditions are good we run well and qualify well. We just need to keep learning what adjustments to make when the track conditions change and it gets hot out. “So, we’re making some strides, we’re still going a round or two. If we can continue this progress, we’ll get better and better. GAINESVILLE, Florida (March 18, 2018) – Jack Beckman got to cross an item off of his bucket list on Sunday afternoon – winning the NHRA Gatornationals. Entering the weekend, the drag racing veteran had 26 Funny Car event wins to his credit, but none of them were from historic Gainesville Raceway. After making four solid qualifying runs, and setting off four win lights on Sunday, Beckman can officially add ‘winning the Gatornationals’ to his impressive resume. “The Gatornationals came on the schedule in 1970 when NHRA went from four races to seven. That was the super season, the first year they crowned a Funny Car champion. 1970 was a big year for our sport, and [the Gatornationals have] been at this track ever since then, and I’ve never gotten close. It was such a bucket list thing,” said Beckman, who started race day from the No. 1 spot, making him the third consecutive Funny Car driver to win from the top seed. Along his way to the Winner’s Circle, Beckman defeated Jim Campbell, Del Worsham and Shawn Langdon before squaring off against his DSR teammate, Matt Hagan, in the final round. It was Beckman’s 54th Funny Car final, and first at the Gatornationals. Hagan and Beckman made nearly identical runs in their Dodge Charger R/T Funny Cars powered by Pennzoil, but Beckman’s reaction time advantage earned him the win, with his 4.035-second pass edging Hagan’s 4.034. Not only did Beckman get to finally achieve his goal of winning ‘the Gators,’ but Sunday’s victory was also a sentimental one for the driver of Terry and Doug Chandler’s Infinite Hero Foundation Funny Car. Sunday’s win was the 27th of Beckman’s professional career and first of 2018. He moved from sixth to ranked second in the NHRA Funny Car points standings. After qualifying third, the 2013 NHRA Gatornationals Top Fuel event champion faced rookie Audrey Worm in round one. Brown, the 2017 Gatornationals runner-up, had the advantage at the step. The car smoked the tires early into the run, and Brown pedaled it down the Gainesville Raceway stretch to pick up an ugly round win over Worm who encountered problems right at the hit. In the quarterfinals, the three-time Top Fuel champion went to battle with his DSR/Army Racing teammate, Leah Pritchett. Both drivers made solid runs, but Brown was able to edge past Pritchett for the win. Brown’s day ended with a semifinal matchup versus Richie Crampton. For the third round in a row, Brown had the better reaction time. Unfortunately, his dragster went up in smoke almost immediately and Crampton was able to pick up the round win. Pritchett clocked a 3.735-second at 321.50-mph pass in the Papa John’s/FireAde Top Fuel dragster to knock out Terry Haddock in the opening round of eliminations. She showcased her quick reflexes with a .053 reaction time at the starting tree, the quickest light of the round. Pritchett’s day ended in the quarterfinals with a 3.779-sec run. Despite making the second quickest pass of the session, it wasn’t enough to overcome teammate Antron Brown’s even quicker and faster 3.793-sec run. “We are still making progress. I feel like we have our gremlins out of the way. Our hot rod is back and it showed it on the track today. I take the blame for losing to my U.S. Army teammate Antron Brown. He came out stronger. It’s extremely frustrating. I missed it. I’ve been on it all weekend in both cars and missed it when it counted most. We win together as a team and it feels great. The highs are high and the lows are low. Having to sit on that for two weeks waiting for Las Vegas isn’t going to be fun, but we get to switch gears and put ourselves in the Four-Wide mindset. This has been an exciting, very high-paced weekend in Gainesville. I’m disappointed it ended early, and on my shoulders, but we’ll bounce back. Pritchett was first off of the starting line in both rounds of Factory Stock Showdown competition. Despite her reaction time advantage, her second round opponent Randy Taylor was able to take the lead and cross the line first, ending Pritchett’s first Factory Stock Showdown event of the year with a quarterfinal finish. After resetting the Gainesville Raceway speed record earlier in the weekend and running low E.T. of the first qualifying session, the defending event champion looked prime for a repeat. Schumacher began his race day with a round one matchup versus Brittany Force. Force made her best run of the weekend, but it was no match for Schumacher’s 3.717-second pass, which held up to be best of the raceday. The winningest Top Fuel driver in Gainesville Raceway history faced Shawn Reed in the quarterfinals. Schumacher was first off of the line but an electrical short inside the cockpit prevented him from making a clean run, and it was Reed’s race to win. The three-time Gatornationals Funny Car champion earned a spot in the top half of the field after running low E.T. of qualifying rounds three and four, picking up six valuable bonus points. On race day, Ron Capps’ first opponent was Bob Tasca III. Tasca and his team weren’t taking Capps lightly, when they clocked their best run of the weekend (3.981), but it was no match for Capps’ 3.959. In round two, the 2016 World Champion had lane choice versus Courtney Force. Capps was first off of the starting line and never trailed for the win. He drove his NAPA AUTO PARTS Dodge Charger R/T down Gainesville Raceway in 4.060-seconds and into the semifinal round. It was a battle of the DSR Dodges in round three as Capps took on his teammate Matt Hagan. Capps pulled away first but hazed the tires early. Unfortunately for Capps, Hagan was able to make a clean pass, setting off the win light and ending Capps’ day. “You know, it’s such a big race, the Gatornationals. These big races seem to take a little bit more to get over. And the further you go on Sunday, like we did getting to the semifinals, you feel like you have a good shot. The way I look at it, the more runs we give [crew chief] Rahn Tobler, the more competitive our car is going to get, and I really felt like we had a handle on it. For some reason, it smoked the tires at the hit of the throttle, and we haven’t done that in a long time. Hagan’s run to the final round in his Mopar Express Lane Dodge included a first-round win over Tim Wilkerson and then a wild, fiery ride against Robert Hight in the quarterfinals. Hight’s engine exploded near the 660-ft mark, with his Funny Car body flying apart. As Hagan raced by in the right lane his engine did the same, sending the car body flying high in the air, but Hagan was able to cross the line at 4.027/291.26 to earn a hard-fought round win. The Mopar Express Lane Dodge team and crew chief Dickie Venables thrashed and dug deep to get a backup car ready for Hagan to face DSR teammate and Mopar-powered Dodge Charger R/T driver Ron Capps in the semifinals. The hard work paid off as Hagan posted a solid 4.056/310.91 to advance to his 49th career final round and reach a remarkable milestone, his 500th career round of racing. “We had a pretty great race day, to be honest. I’ve never been to the finals in Gainesville. We kind of started off with a whole new game plan from qualifying and the track conditions were pretty good. We obviously had a huge blow up in the second round. Then to watch these guys pull the other car back out and put it together in the amount of time they had, and to turn a win light on against Capps then to be able to go to a final, it was huge and it speaks for itself. GAINESVILLE, Florida (March 17, 2018) – No one was able to top Jack Beckman and the Infinite Hero Foundation Funny Car team during day two of the NHRA Gatornationals. The Dean Antonelli, John Medlen, Neal Strausbaugh-led team’s 3.911-second Q2 pass held up to be best of the weekend, earning Beckman his first No. 1 qualifier of the year, and 24th of his career. It is the 2012 Funny Car World Champion’s second pole at Gainesville Raceway. After two class-best runs on Friday, Beckman made two more respectable runs during the third and fourth qualifying rounds on Saturday. While not low E.T. of the session, their 4.025-second pass was fourth best of the round, and their 4.007 from Q4 earned the team one bonus point for third quickest. With four solid runs in the books and conditions that promise to be similar to Friday, Beckman feels confident in his team’s abilities to put Terry and Doug Chandler’s Infinite Hero Foundation Dodge Charger R/T in the Winner’s Circle on Sunday. “I love the fact that we did everything pretty darn good for four runs over the course of the two days here. I think it gives us a leg up going into tomorrow. We’ll have lane choice and we’ll get to pick when we’re going to run. We could make a poor decision, but I like that it’s our decision to make. “I think by and large, you make your own luck. The team services the car perfectly, the crew chiefs put their heads together, go over data from past runs with similar conditions and make an educated tune-up there, and then you try and outdrive the person in the other lane. You race the race track. We have to do everything a little bit better than they do, but in our lane. Beckman’s campaign for his first Gatornationals Wally begins with a matchup versus No. 16 qualifier, Jim Campbell. GAINESVILLE, Florida (March 16, 2018) – Jack Beckman and the Infinite Hero Foundation team led Funny Car qualifying on Friday at the Gatornationals. Living up to his nickname, ‘Fast Jack,’ is ‘three for three’ in 2018, having finished Friday from the top spot at every event of the year so far. After running low E.T. in the opening qualifying round of the weekend, Beckman followed up his session-best run with another class-best effort powered by Pennzoil. His 3.911-second Q2 pass secured his third provisional No. 1 qualifier of 2018 and brought his year’s bonus point total to 16. Don Schumacher Racing, headquartered in Brownsburg, Ind., fields seven professional NHRA teams. In Top Fuel, the U.S. Army dragster driven by eight-time world champion Tony Schumacher, the Matco Tools/U.S. Army dragster driven by three-time world champion Antron Brown and the Mopar/Papa John’s Pizza/Pennzoil/FireAde/U.S. Army dragster driven by Leah Pritchett; and in Funny Car, 2016 world champion Ron Capps in the NAPA AUTO PARTS Dodge Charger R/T; two-time world champion Matt Hagan in the Mopar Express Lane Dodge Charger/Sandvik Coromant R/T, and 2012 NHRA world champion Jack Beckman in Terry and Doug Chandler’s Infinite Hero Foundation Dodge and the Chandlers’ Make-A-Wish Dodge driven by Tommy Johnson Jr.
DSR has won 319 NHRA national event titles and 16 world championships.